Handmade Rain Tree Wood Bottle Puzzle from Thailand, "Don't Break It"
Demonstrating his creativity and love for games, Thai artisan Waraporn Khamsuk creates this ingenious puzzle that is perfect for entertaining friends and guests. The goal is to figure out how to free a wine bottle using four pieces of interlocking rain tree wood, a task which will prove to be an enjoyable and motivating challenge. 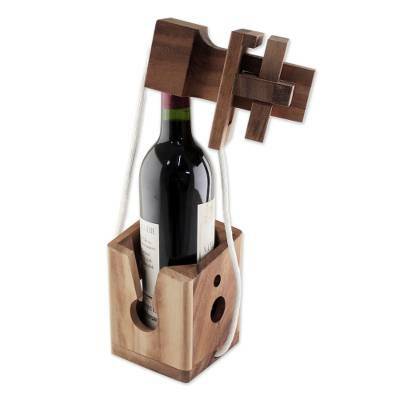 The puzzle is reusable and fits a 12 inch by 3 inch wine bottle. You can find wood puzzle 'Don't Break It' by Waraporn Khamsuk in chess sets games categories such as Wood Chess Sets Games and Puzzles Chess Sets Games. Enjoy exploring these sections for other Novica treasures. Waraporn has grown her passion for wooden puzzle games into a successful workshop. She employs a number of artisans and has expanded her range from puzzles to wooden tableware. Through personal dedication and increased access to the global market that Novica provides, Waraporn has been able to increase her sales. The steady income from Novica sales has been instrumental in providing the stability that she needs to continue moving-up. Waraporn is grateful to be able to help educate her brother. He recently began to study at the university. Waraporn Khamsuk has received a $1400 microcredit loan with 0% interest.